This issue of The Orthodox Word features a homily by St. John Damascene (ca. 675–749), delivered on Holy Saturday at the Monastery of Mar Sabbas near Bethlehem, where he lived for many years as a monk. The homily, translated by Tikhon Alexander Pino, is presented here for the first time in English. An editor’s preface by Abbot Damascene places the homily in its historical context and traces the theological threads that run through it. 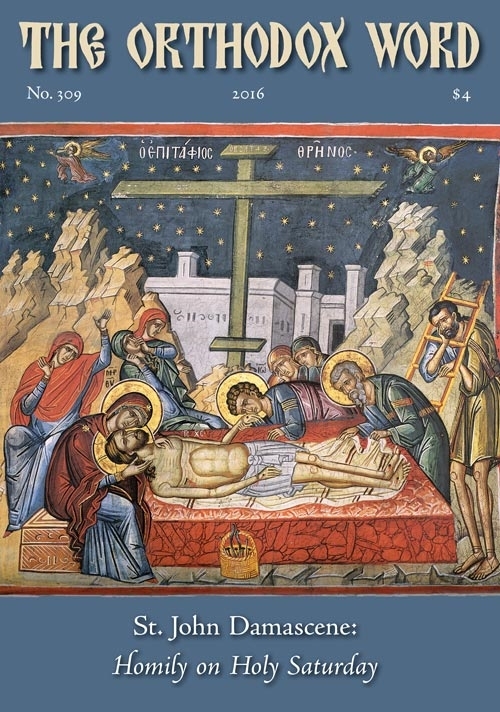 St. John, in order to disclose to his listeners the significance of what the Church commemorates on Holy Saturday, set forth in his homily a panoramic schema of our salvation. Like a master craftsman laying and building upon a foundation, he presented the theological meaning of Christ’s death on the Cross for our salvation, explaining (within the limitations of feeble human words) the mystery of why and how Christ, through His death, became the Victor over sin, death, and hell, and the Harbinger of resurrection. Also included in this issue is our second article by the well-known Russian writer Alexander Tkachenko, staff writer for the journal Foma (Thomas), entitled “Words in the Sand.” In this article the author presents his thoughts on the Lord’s forgiveness of the woman caught in adultery (John 8:3–11), and on the possible meanings of the words Christ wrote on the ground as her accusers waited for Him to answer their question concerning her sentence.